Owen Willans Richardson was awarded the Nobel Prize in Physics in 1928 "for his work on the thermionic phenomenon and especially for the discovery of the law named after him." He held positions at Cambridge University's Cavendish Laboratory, Princeton University, King's College of the University of London, and the Royal Society. April 4, 1879Birth, Dewsbury (England). 1900Obtained BSc, Trinity College, Cambridge University, Cambridge (England). 1902Fellow, Trinity College, Cambridge University, Cambridge (England). 1904Obtained DSc, University College, London (England). 1906 – 1913Professor of Physics, Princeton University, Princeton (N.J.). 1914 – 1944Wheatstone Professor of Physics, King's College, University of London, London (England). 1920Awarded the Hughes Medal, Royal Society. 1921President, British Association for the Advancement of Science. 1926 – 1928President, Physics Society, London (England). 1926 – 1944Yarrow Research Professor, Royal Society, London (England). 1928Awarded the Nobel Prize in Physics "for his work on the thermionic phenomenon and especially for the discovery of the law named after him". 1930Awarded the Royal Medal, Royal Society. Advised by Richardon at Princeton University. Advised by Richardson at Princeton University and co-wrote a few articles. Advised by Richardson at Princeton University. Advisor at Cavendish Laboratory, Cambridge University. Advised by Richardson at Princeton University, "On the positive ionization from certian hot salts together with some observations on the electrical properties of molybdenite at high temperatures." Brother-in-law and collaborated at Cavendish Laboratory, Cambridge University. 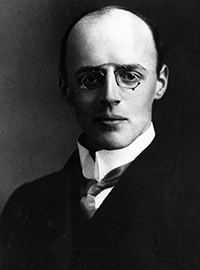 Fellow; Yarrow Research Professor; and awarded Hughes Medal (1920) and the Royal Medal (1930). Received BSc degree (1900) and Fellow. O.W. Richardson papers [microform], 1899-1947. History of physics II [sound recording], 2011 May 2. King's College Department of Physics records, -1984. Oral history interview with Harlow Shapley, 1966 June 8 and August 25. Oral history interview with Otto Stuhlman, Jr., 1962 June 8. Oswald Veblen papers, 1881-1960 (bulk 1920-1960). The electron theory of matter / by O.W. Richardson. The emission of electricity from hot bodies. O. W. Richardson Nobel Prize biography.